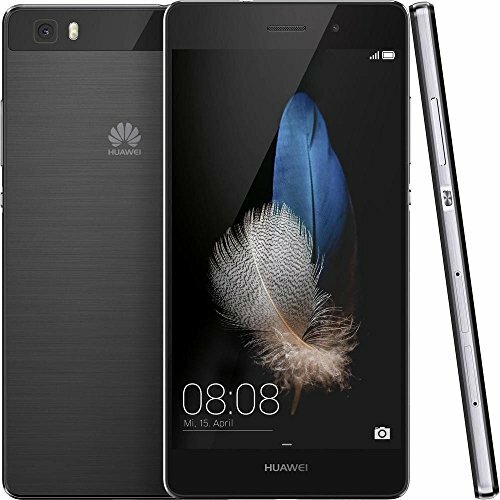 IF SUB smartphones are on your agenda, Huawei’s P9 Lite is worth a look, but we’ve been more taken with the 2017 remake of the P8 Lite – it has a slightly better processor (a Kirin 655 to the P9 Lite’s 650) and, while it originally came with a higher price, we’ve actually found the P8 Lite for less cash post-launch. That’s not all that’s good about it, either. The P8 Lite is a dual-SIM smartphone that features a 5.2in Full HD display, a fingerprint reader and an octa-core processor, and it runs on Android 7.0 – not bad, which is around the same price as the Moto G5. Speaking of which, competition at this price is fierce, from older handsets like the G4 to newer alternatives such as the Honor 6X and the Lenovo P2. Fortunately for the P8 Lite, it gets off to a good start with its design. The rounded corners and balanced weight make it easy to hold, and we appreciate how the fingerprint scanner is placed on the rear rather than the front, so it’s easier to use with your index finger. It’s not as slick as the iPhone 7 it’s so obviously emulating, but it’s certainly nice enough for a budget phone. It’s also good to see Huawei retaining the 3.5mm headphone socket, found here on the top edge of the phone, with the volume rocker and power buttons on the right-hand side, a dual-SIM slot on the left (the second SIM slot can also take a 256GB microSD card), and a Micro USB charging port and a single downward-firing speaker on the bottom. However, there are some practical issues as well. The plastic frame surrounding the screen, for instance, lowers the tone, as does the standard glass, which appears not to have been treated with an oleophobic coating, meaning it picks up fingerprints like crazy, and is shockingly quick to pick up scratches. We’d suggest a case or protector for the IPS display, which works out to a respectable pixel density of 424 ppi. An even bigger strength is its brightness – its test score of 700cd/m2 is among the highest we’ve seen, and it stays readable in even the sunniest conditions. Contrast ratio is pretty high, too, at 1,553:1, with deep blacks and bright whites contributing to dynamic images and video. We’d have liked to have been able to disable dynamic contrast, though: this boosts brightness levels when displaying white or light content onscreen, which could hurt battery life. The display’s main weakness is its color representation. With 86% sRGB coverage, images look slightly dull and murky when compared with the Lenovo P2’s 99.9% sRGB coverage display. 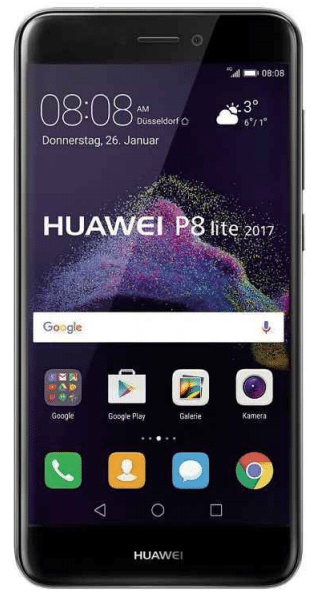 Unlike the P2, however, the P8 Lite runs the latest version of Android, 7.0 Nougat, which is a fantastic mobile OS, even with Huawei’s Emotion 5 UI (EMUI) skin. This uses extra RAM, which isn’t ideal, but it’s far from the annoyance it once was. We particularly like its storage cleaner, which quickly frees up space and wipes your phone’s cache, as well as its added power-management tools. This refreshed P8 Lite is powered by an octa-core (four 2.1GHz Cortex-A53 and four 1.7GHz Cortex-A53) Kirin 655 processor. It also has 3GB of RAM, which was plenty for our everyday needs. Looking at synthetic benchmarks, the P8 Lite performs well when compared with its budget competitors. In Geekbench 4, it scored 3,237 in the multicore test and 780 in the single-core test, putting it very slightly ahead of the Moto G4, slightly behind the Honor 6X and roughly on a par with the Lenovo P2. Honestly, you’d struggle to see a big difference in day-to-day use. Huawei’s handset is similarly capable of gaming. It didn’t struggle with any of the titles we tried, and in the GFXBench Manhattan synthetic benchmark, it managed 8.4fps. That’s far behind the high-end flagships, but is dead even with the Honor 6X. Battery life, however, is less impressive. The non-removable 3,000mAh unit lasted a mediocre 10h 24m in our continuous video playback test, which is close to a third of the Lenovo P2’s superlative 28h 50m. It couldn’t even beat the Honor 6X’s 11h 18m. The phone’s 12-megapixel rear-facing camera with an aperture of f/2.0 isn’t bad for a £141 smartphone. The P8 Lite doesn’t come with phase-detect autofocus or optical image stabilisation, but that’s only to be expected for a phone at this price point. It holds its own in low-light conditions, producing images that aren’t riddled with noise or oversaturation. White balance is good as well, with automatic exposures being well judged. The flash doesn’t add a blue tinge to photos, either, which is a common problem with smartphone cameras. Sadly, the camera is also prone to losing detail at a medium distances, and the HDR mode proved of limited benefit, with only minor improvements in indoor shots and barely any differences when comparing outdoor HDR shots with non-HDR shots. You can help things along by tinkering in Pro mode, which grants control over white balance, exposure compensation, ISO and shutter speed, as well as various metering and autofocus modes. Still, it’s nowhere near the overall quality of our favorite cheap smartphone camera, that of the Moto G4. This captures images that are sharper, have less image noise in low-light conditions and look more vibrant. Ultimately, while the P8 Lite is a very capable and affordable smartphone (even more so since we first reviewed it, in the latter case), it’s hard to fully recommend when less flawed alternatives exist. If you want the very best battery life, choose the Lenovo P2; if you want the best all-rounder with the best camera, the Moto G4 is the one for you.